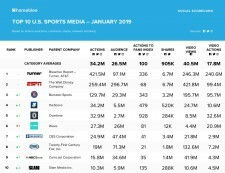 NEW YORK, February 7, 2019	(Newswire.com) - Shareablee Inc., the global leader in audience-based social media measurement, today released their January 2019 ranking of the most socially engaged sports media brands across the United States. 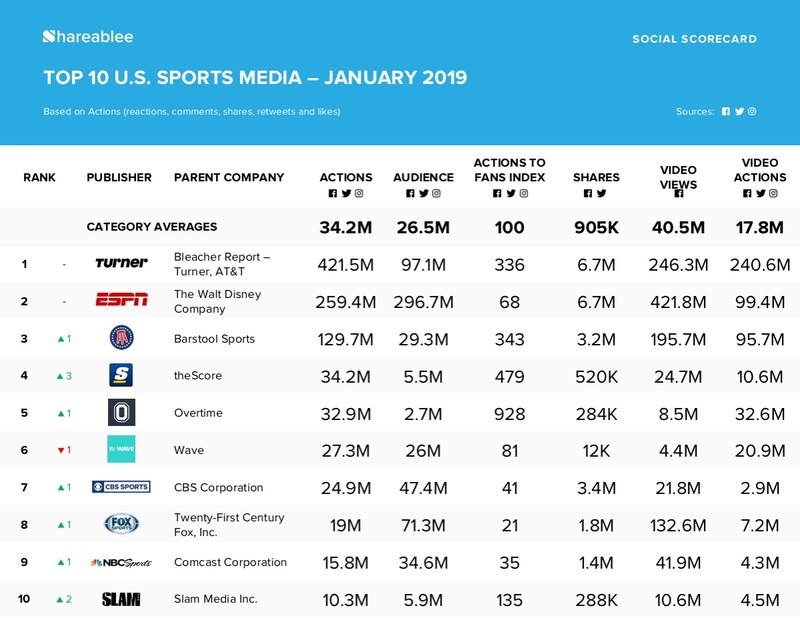 Sports media brands increased 10.1 percent overall and represented a total of 1.026 billion actions (post-level reactions, shares, comments, retweets and likes) across Facebook, Twitter and Instagram over the last month. The Bleacher Report – Turner Sports Network led the ranking with 421.5 million actions, followed by ESPN (259.4 million actions), Barstool Sports (129.7 million actions), theScore (34.2 million actions) and Overtime (32.9 million actions).